“[NPC] will die in 4 days if not treated, as polyps in his appendix burst, showering all in a 5 foot radius with his disease.” Much of your reaction to this module will depend on how this piece of text will make you feel. If you find it absurdly funny, you are going to like Fever Swamp. If you find it puerile, disgusting, or plain doltish, this module will annoy you to no end. In either case, rest assured that the rest is not any worse or better. 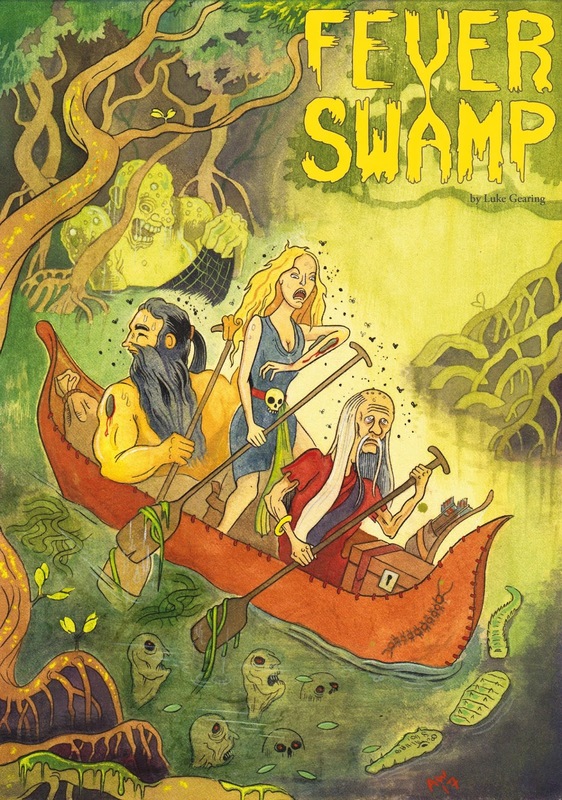 Fever Swamp is a 28-page hex-crawl describing an accursed marshland where player characters may go to pursue one of the adventure hooks provided in this product, or by the GM. They are going to hate it. Fever Swamp is designed with a single-minded determination to make you hate it with every pore of your being. Vile diseases, wound infection, a bestiary of grotesque and lethal denizens, wretched tribes with disgusting customs, burrowing parasites, two apocalyptic forces and an evil cult make it a place you want to get out of as soon as humanely possible. If you like imagery centred on disgust and decay, this module delivers. Everything is foul, dead, insane and wretched. Gruesome mutilations and bizarre deformities populate the marshland. Even roots are described as “grown fat on animal corpses”. There are sickening body horror elements, and the PCs can suffer fates worse than death. There is a disease chart where diarrhoea and weeping sores are a relatively happy outcome. A bunch of original swamp monsters are provided, all macabre, some quite inspired (the stilt-walkers, thin and ragged figures of doom watching cursed locales from atop their swamp-walking stilts, are a classic; and dredgers, deformed giants dragging huge nets through the dirty water in search of victims, are like a bad dream). The product is very brief and compact, with little wasted space (even the interior covers are put to use). Everything is laid out well and perfectly cross-referenced. Utility is very good. With all that, there is not much to the swamp, since the booklet is printed in a rather large font size, and many of the 14 locations are one-paragraph entries. It is dense and expressive, there just isn’t much of it. The entries are rounded out with guidelines and random tables to generate degenerate swamp tribes, and procedures to make the players regret ever having their characters set foot in this foul place. Altogether, Fever Swamp is well-made, creative, and very-very one-note. No playtesters have been listed for this module. Thank you for the review! I now have a very clear picture of the product.